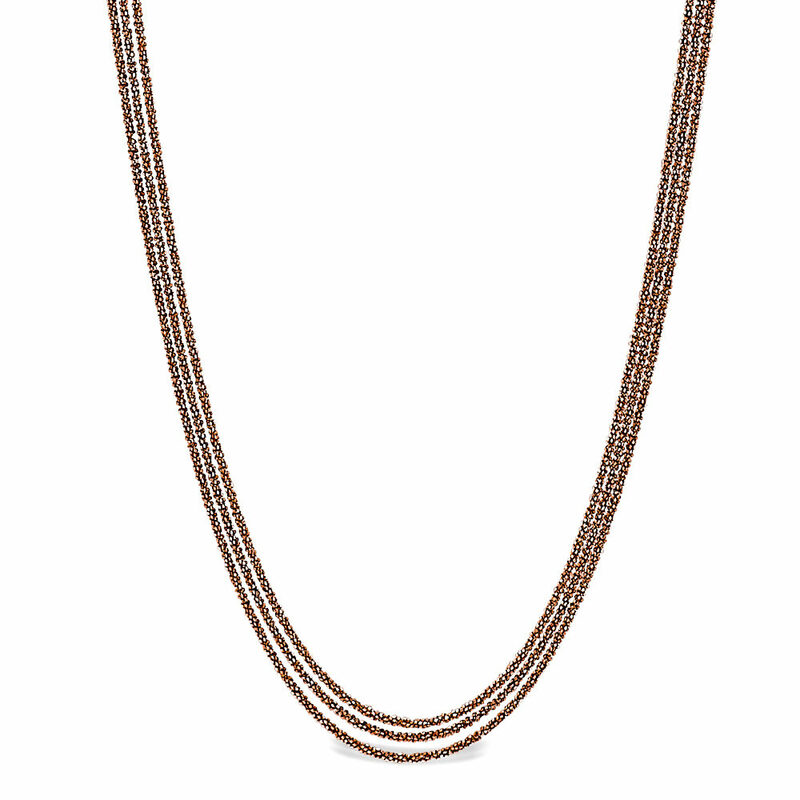 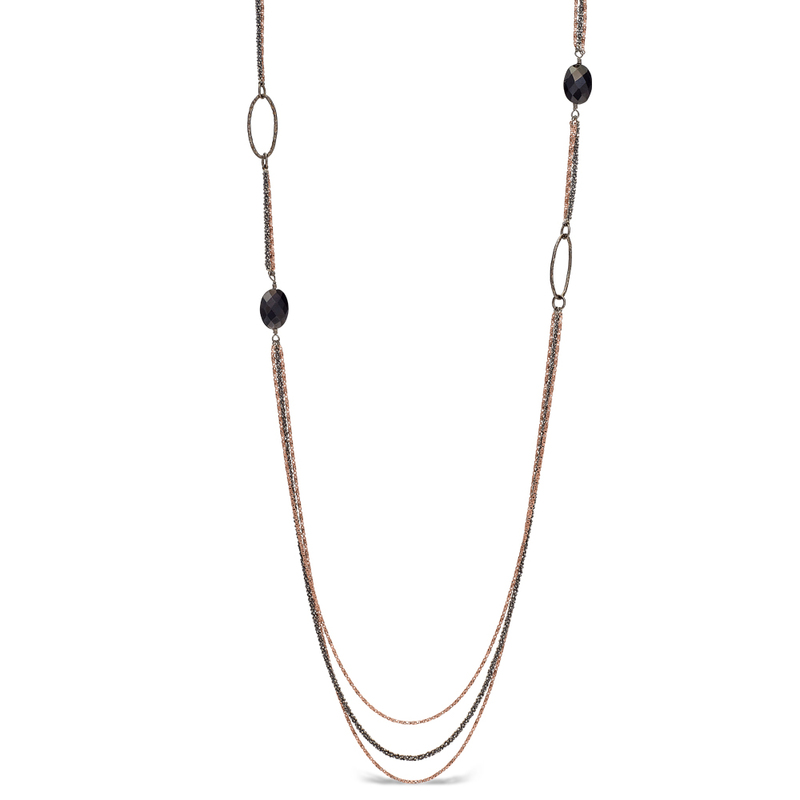 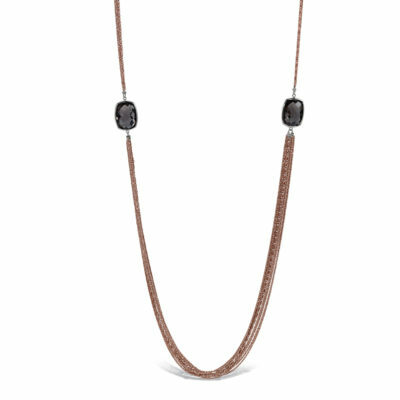 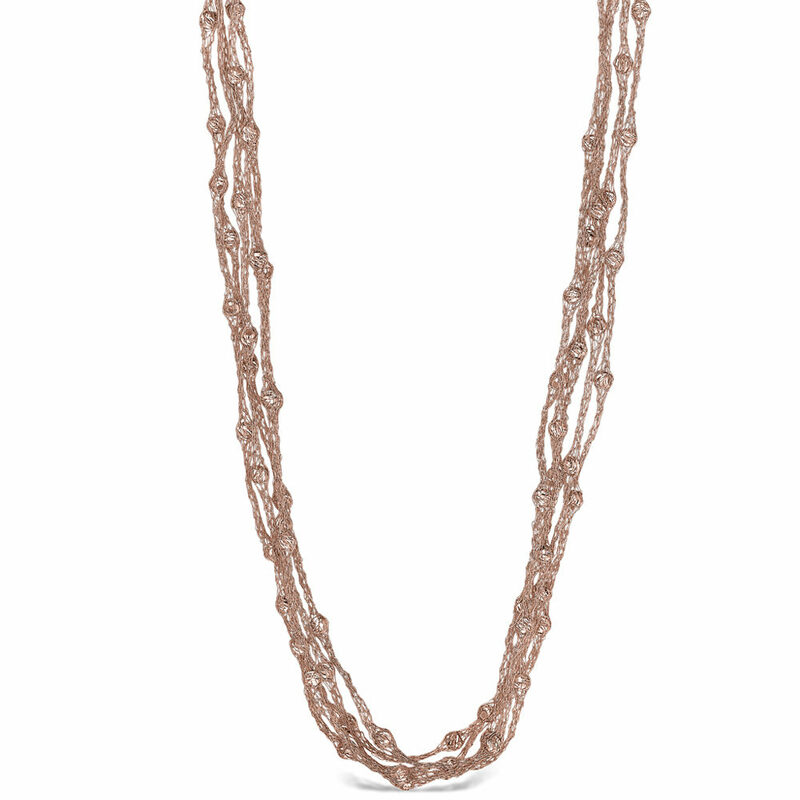 Two large smoky quartz cushions sit at your collar bones, 10 strands of rose washed chain in between. 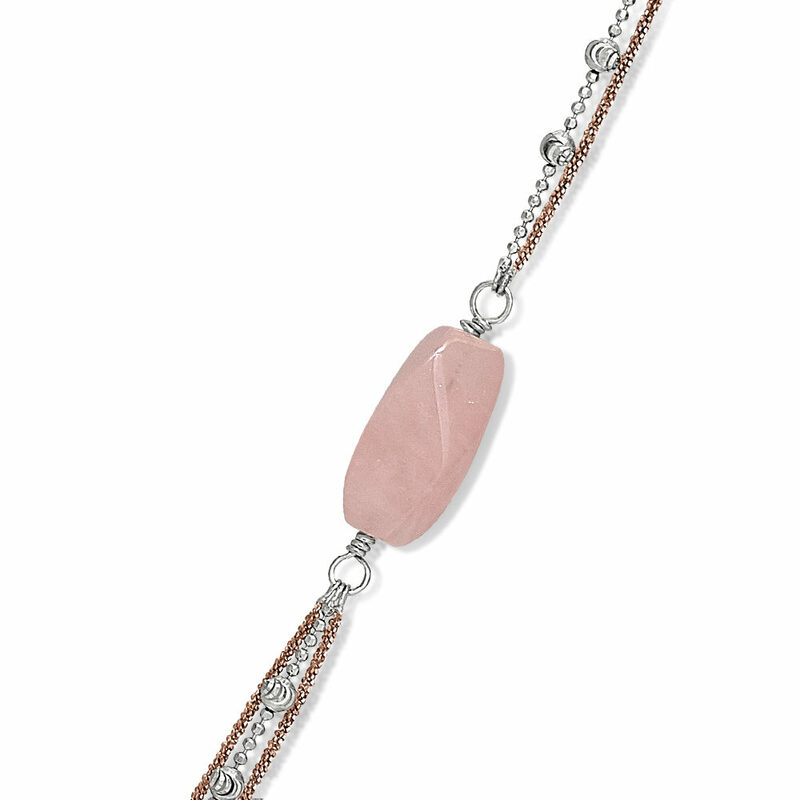 Two colors of rose give this a unique glimmer. 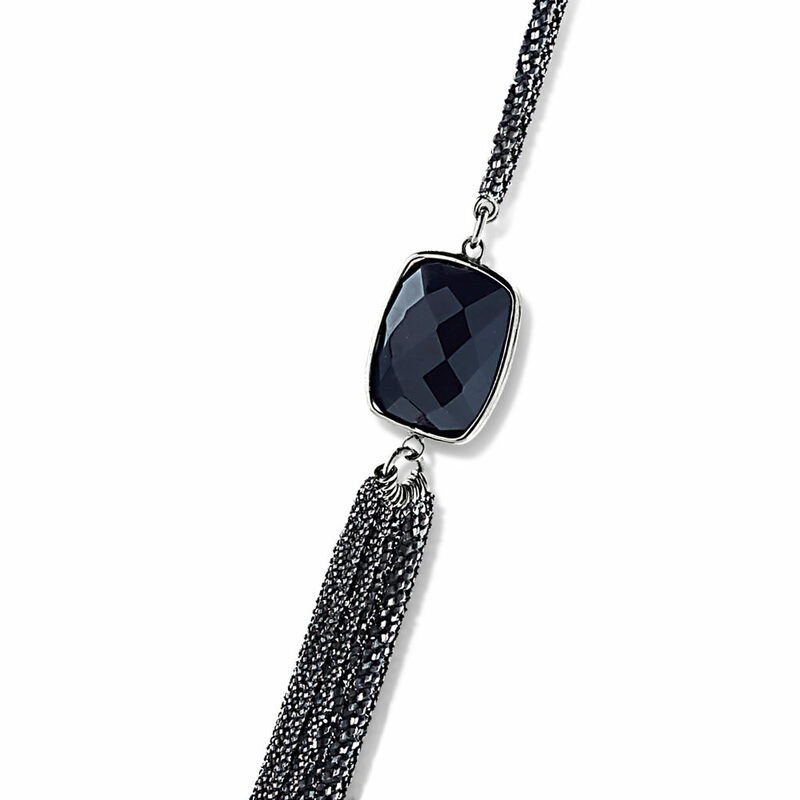 Magnetic clasps make this easy and fun to wear. Two large onyx cushions sit at your collar bones, 10 strands of smoke chain in between. 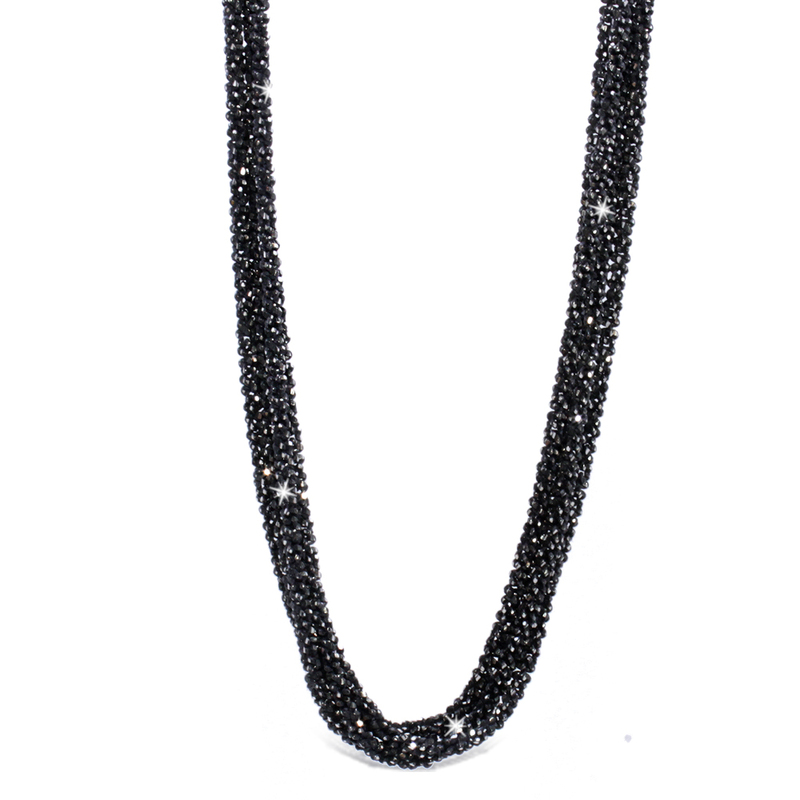 A dramatic fun necklace, this is one of Peter’s favorites. 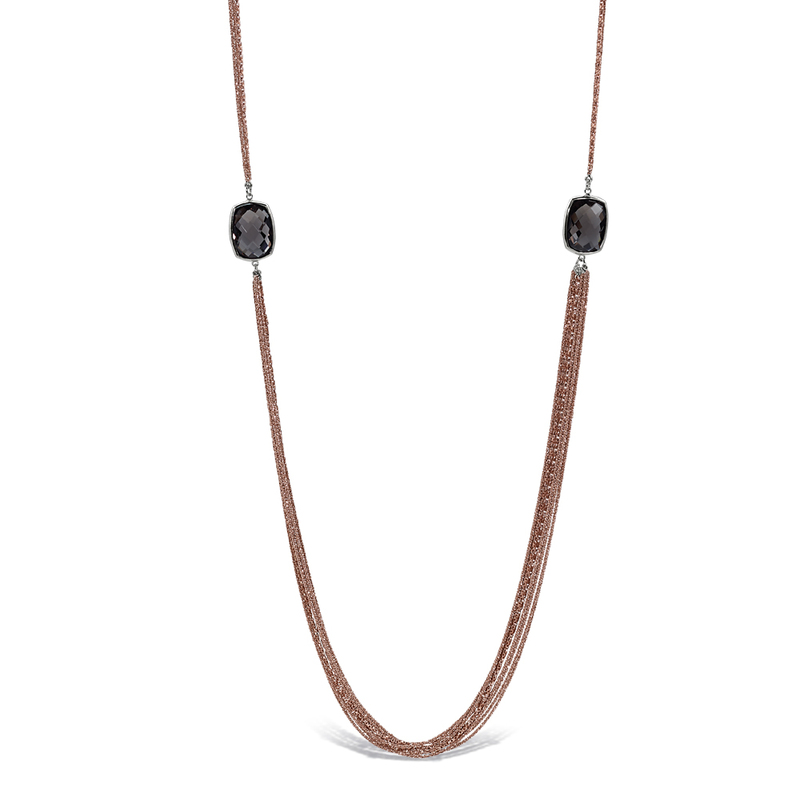 Magnetic clasps make this easy and fun to wear. 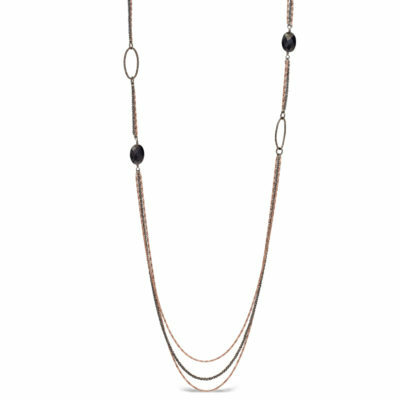 A draping smoke rose necklace, with two marquise silver loops and two onyx stones. 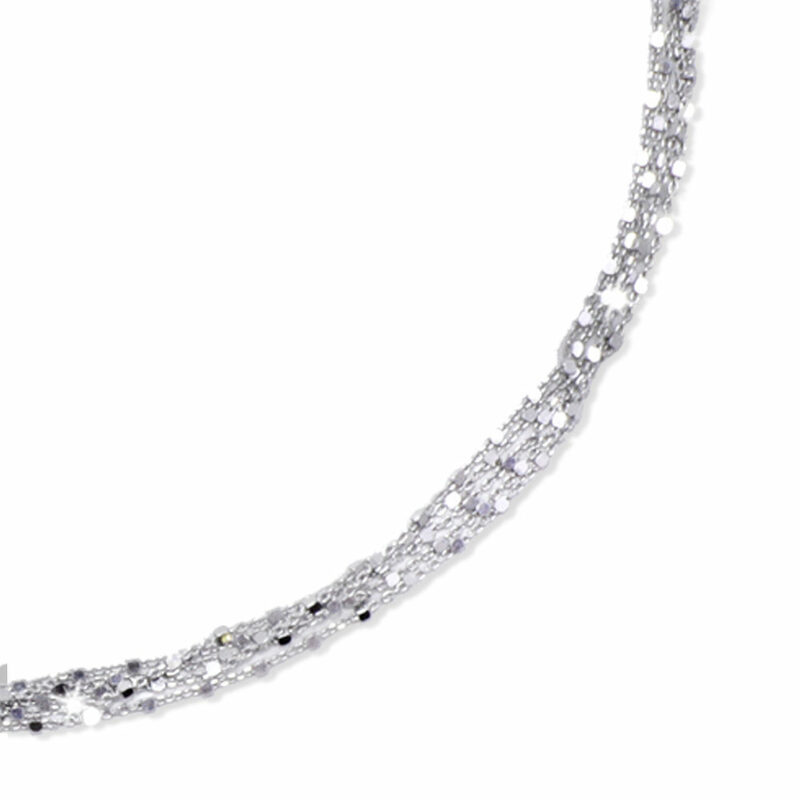 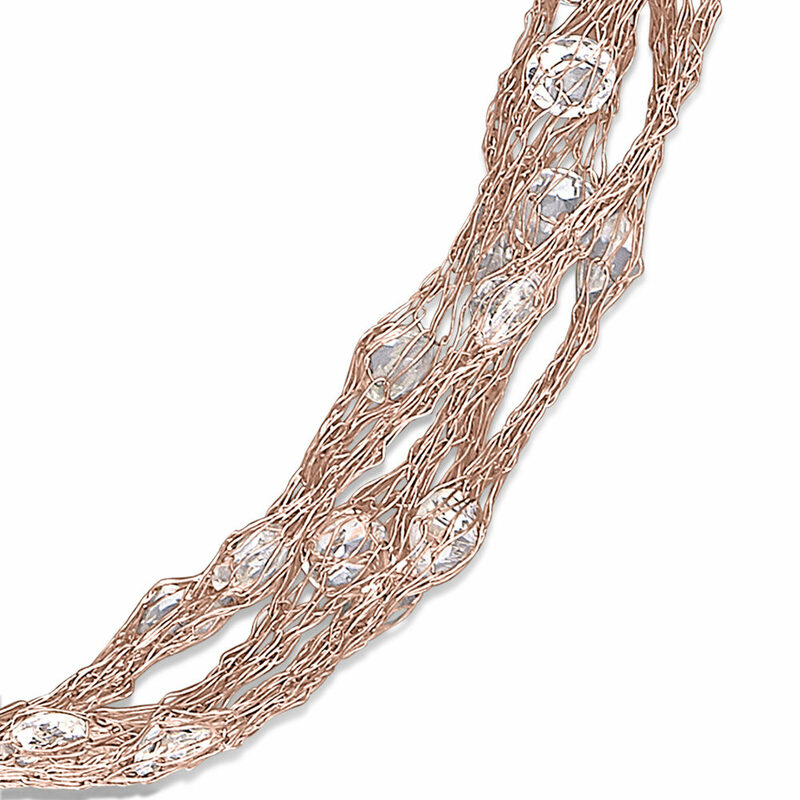 Strands are black rhodium, and rose vermeil. Magnetic clasps make this easy and fun to wear. 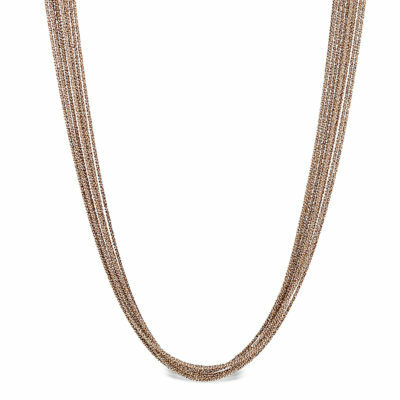 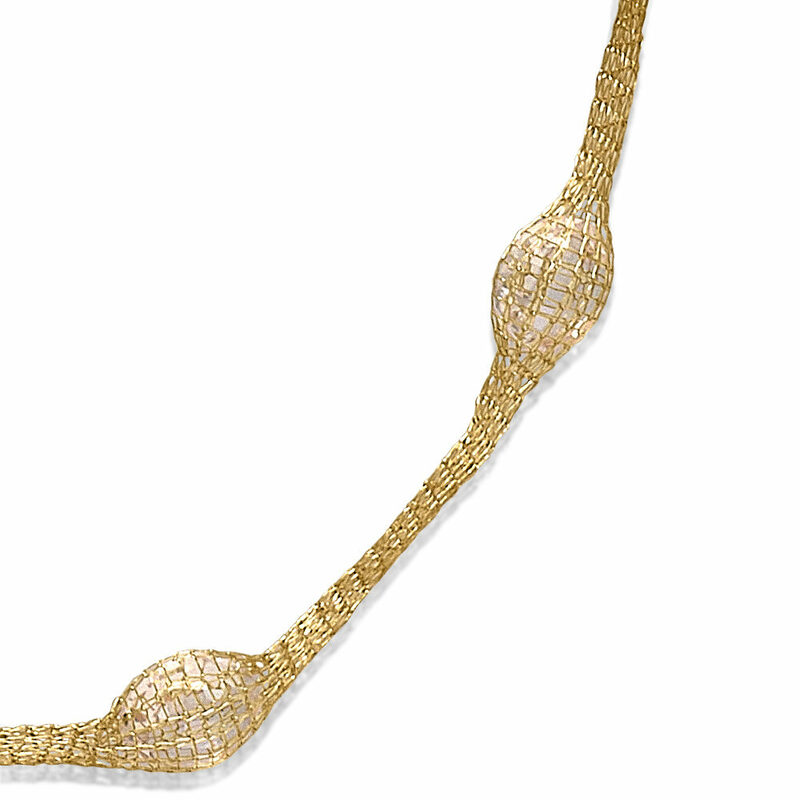 A draping smoke necklace. 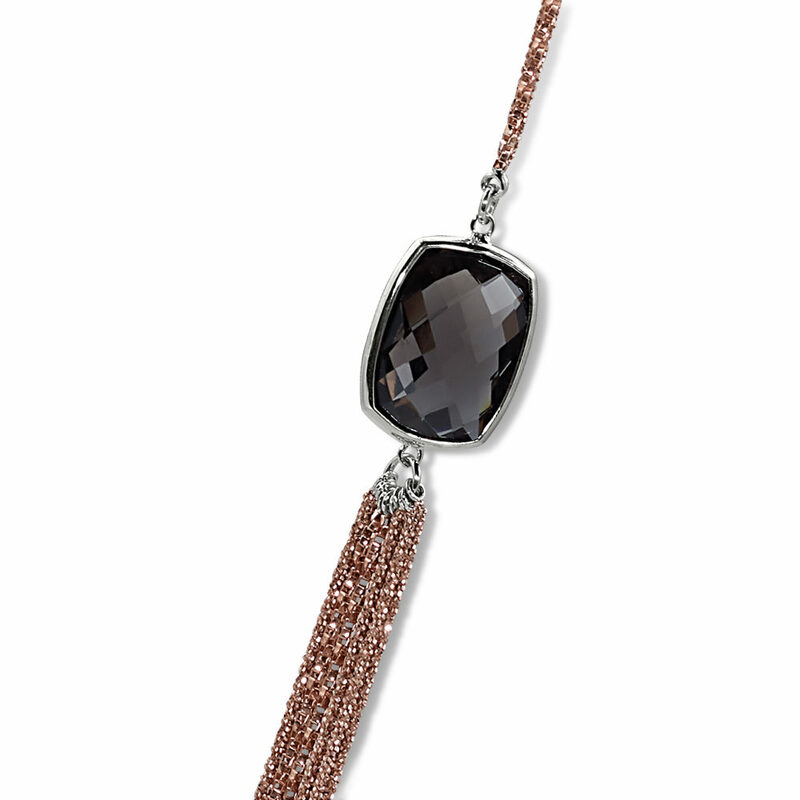 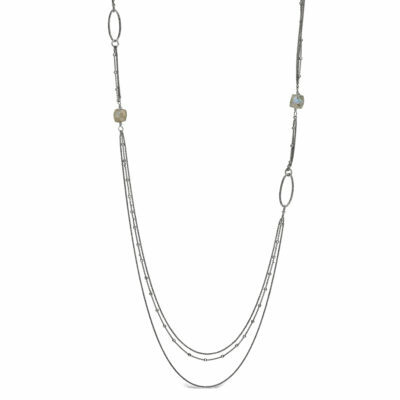 Two tone chain and smoky diamond cut silver beads. 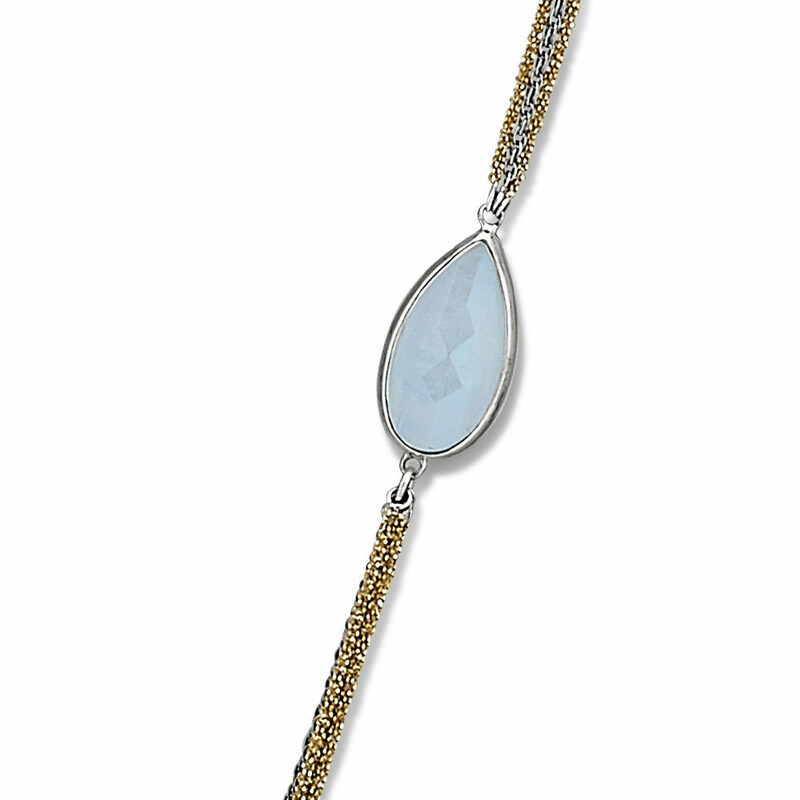 Marquise silver loops and two labradorite stones. 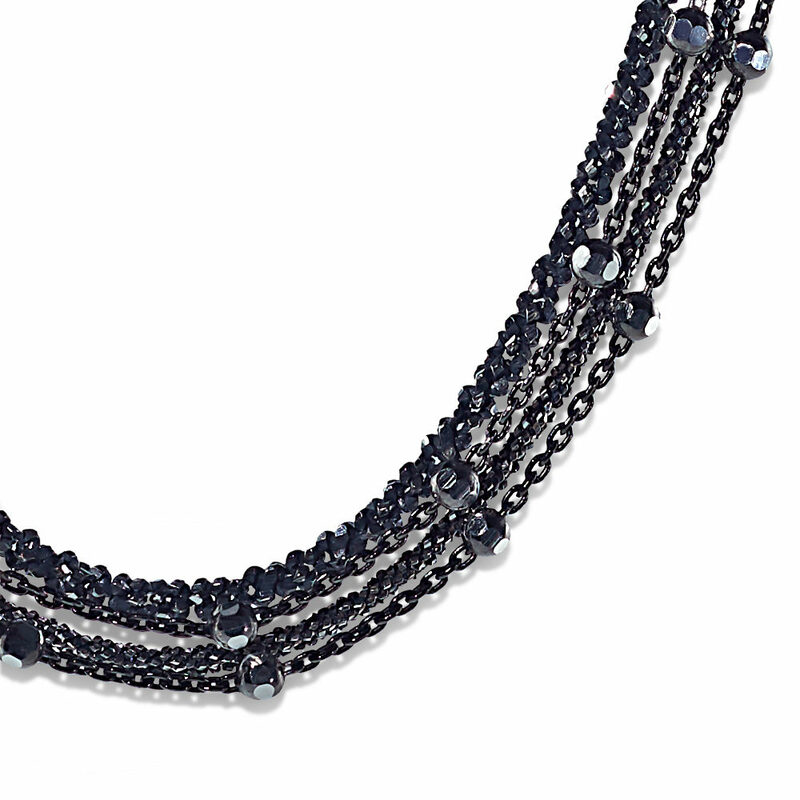 Strands are black rhodium, a smoky contrast to the labradorite. 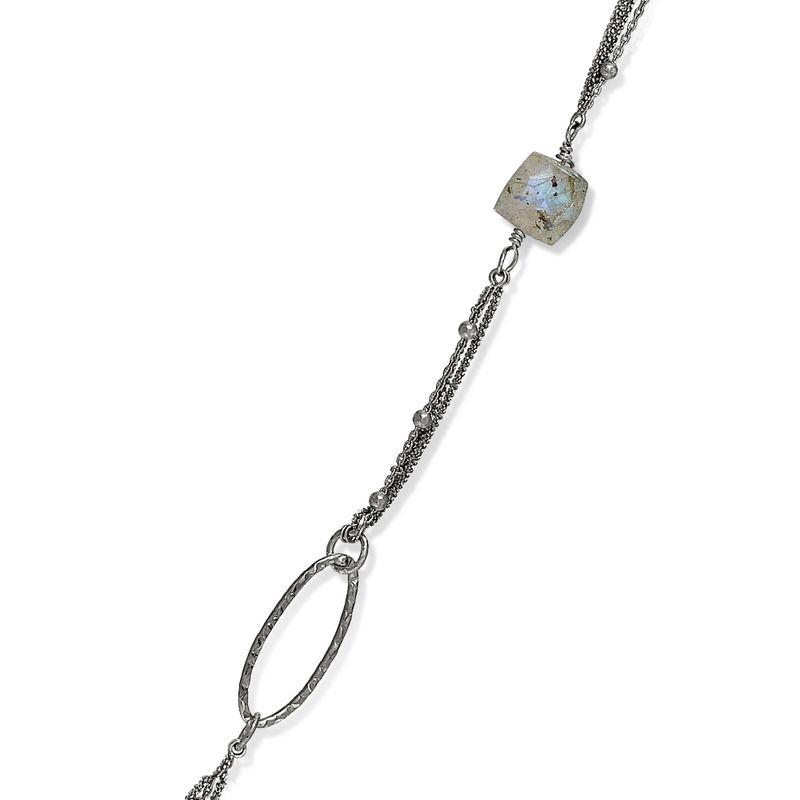 Magnetic clasps make this easy and fun to wear. 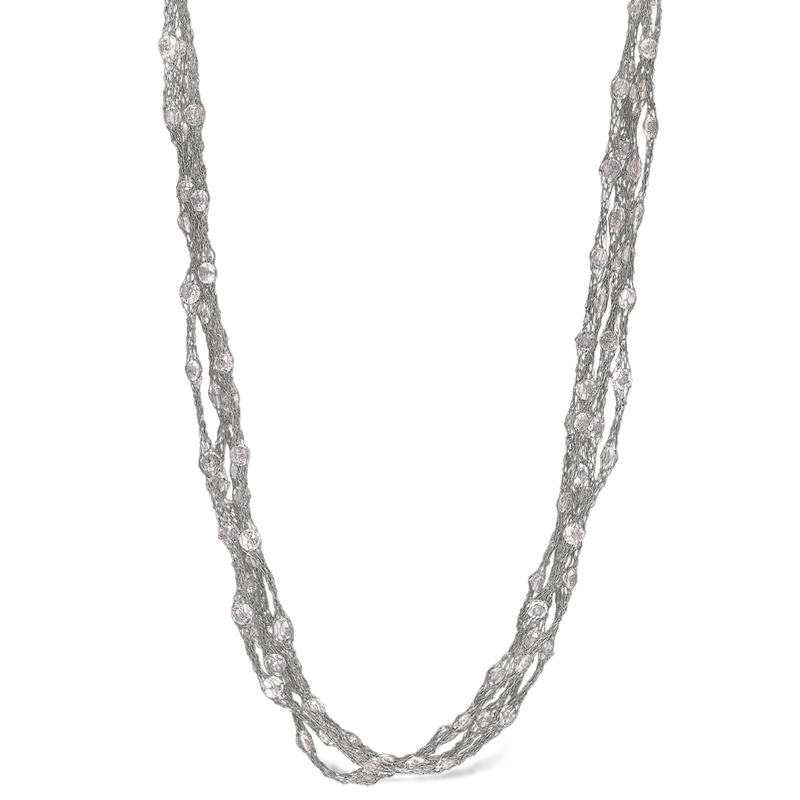 A draping silver rose and white necklace. 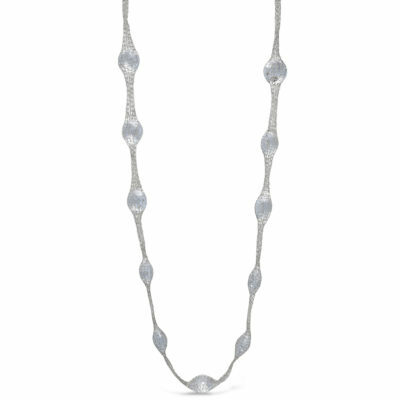 Two tone chain and white diamond cut silver beads. Two twisted rose quartz suspended between layers of chains, 36in length. 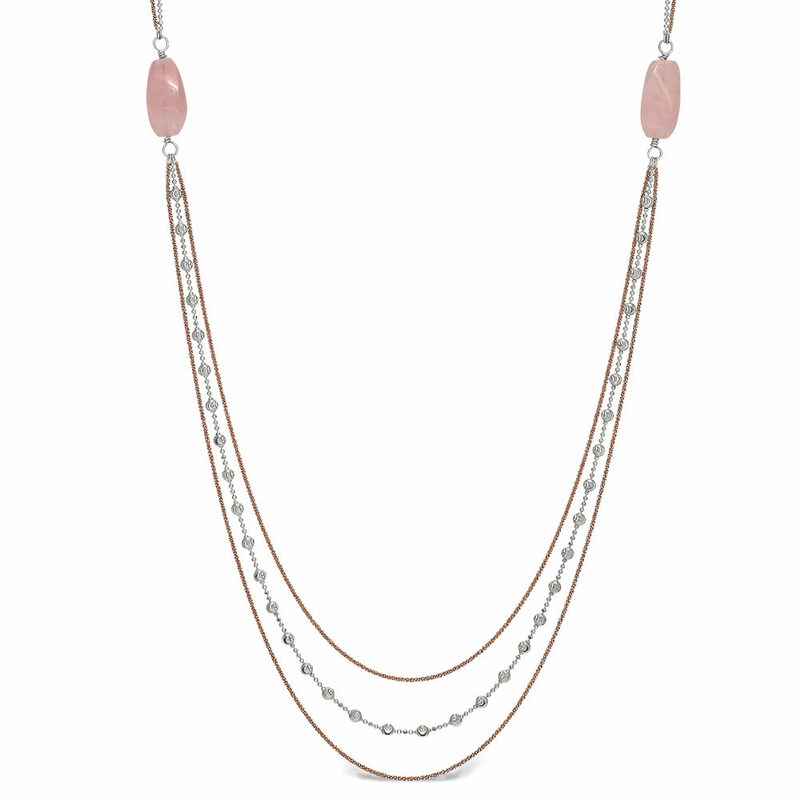 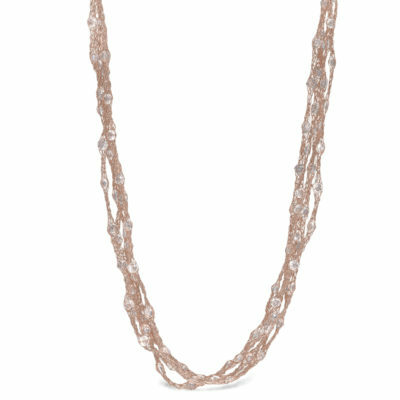 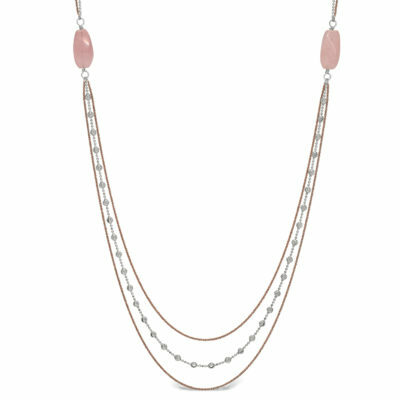 Pink chain is rose vermeil silver. 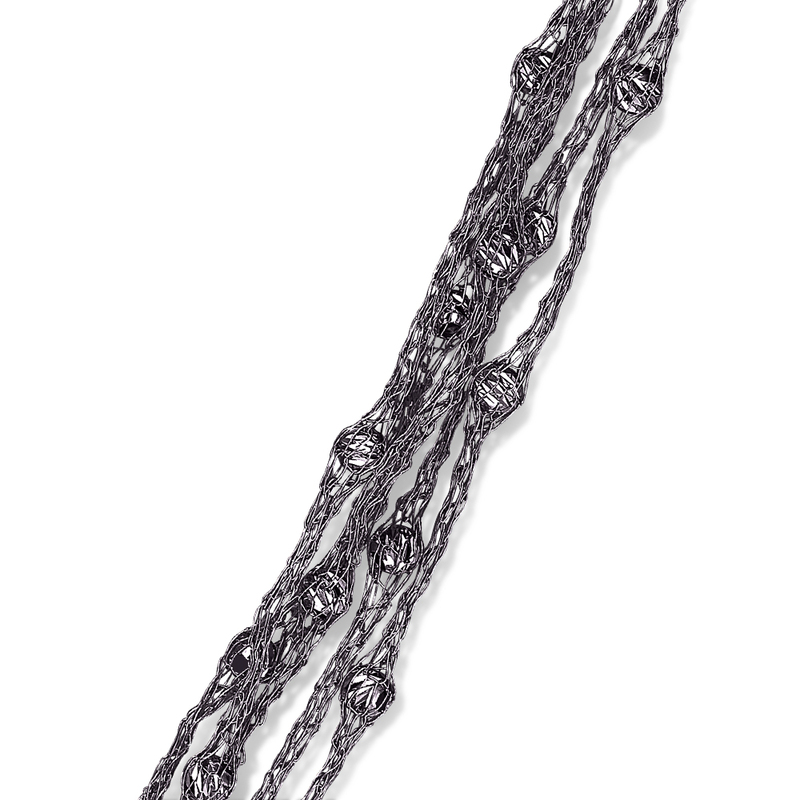 Magnetic clasps make this easy and fun to wear. A draping silver white necklace. 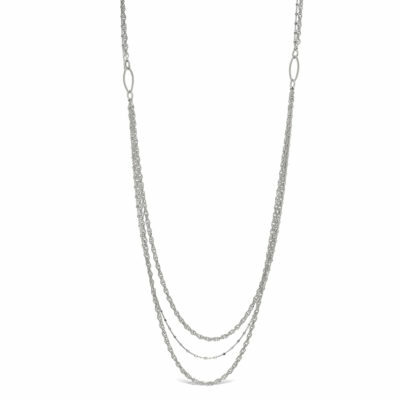 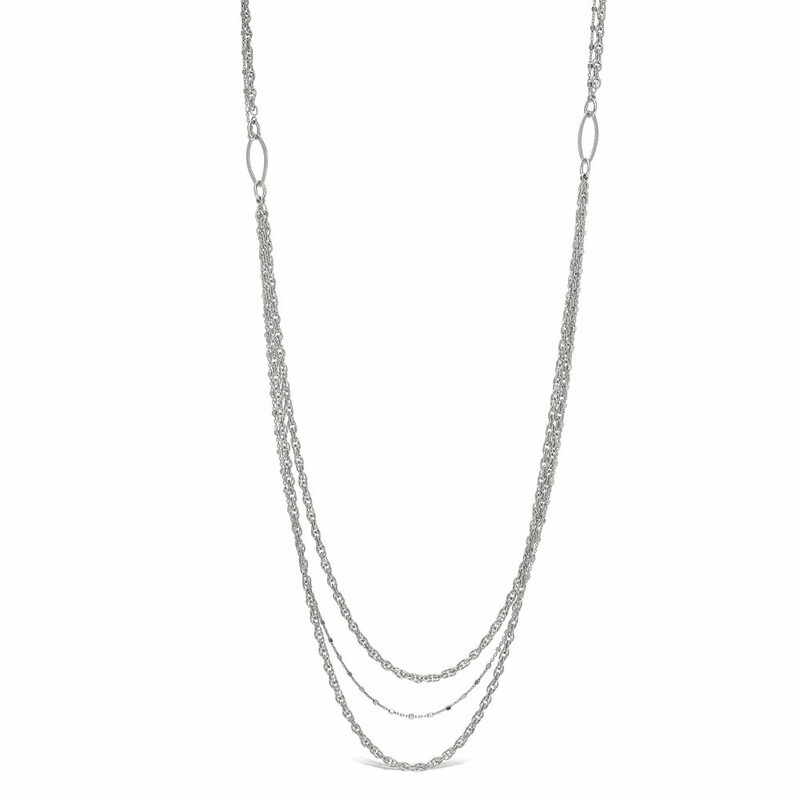 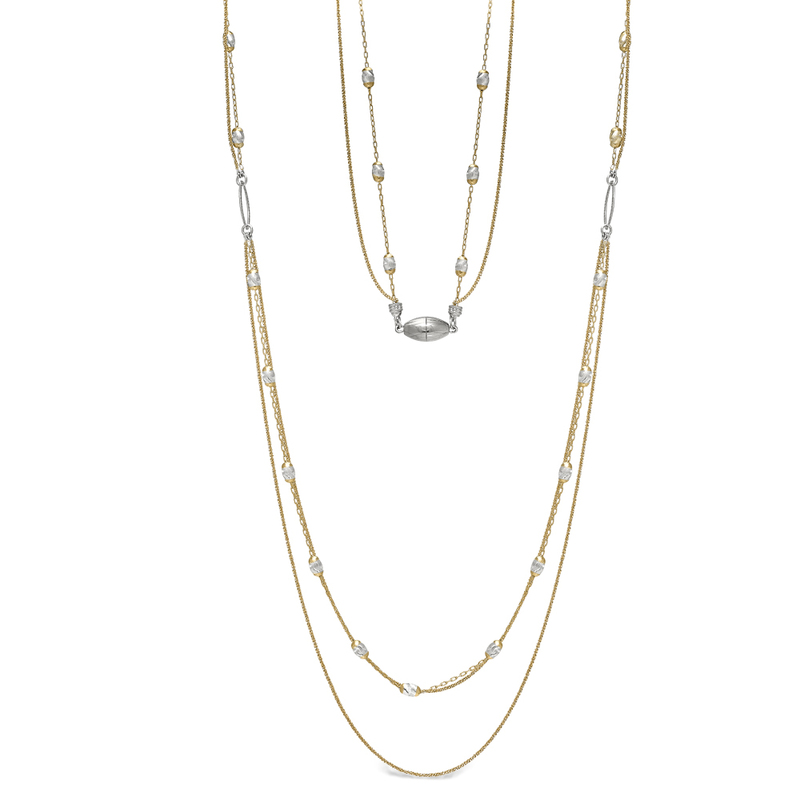 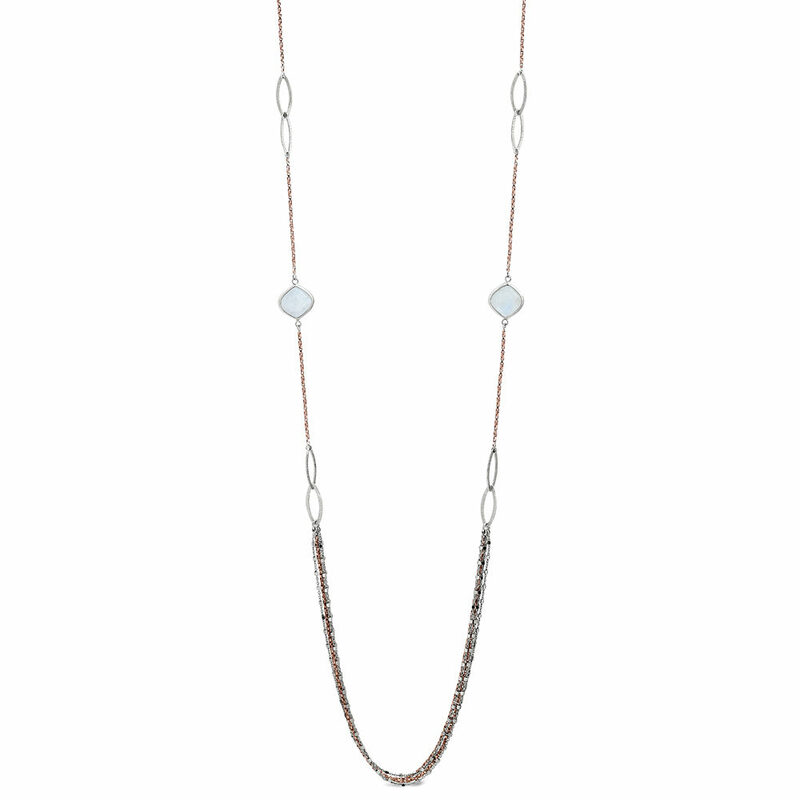 White and faceted chain with a marquis drop on each side. Three layers of silver chains. 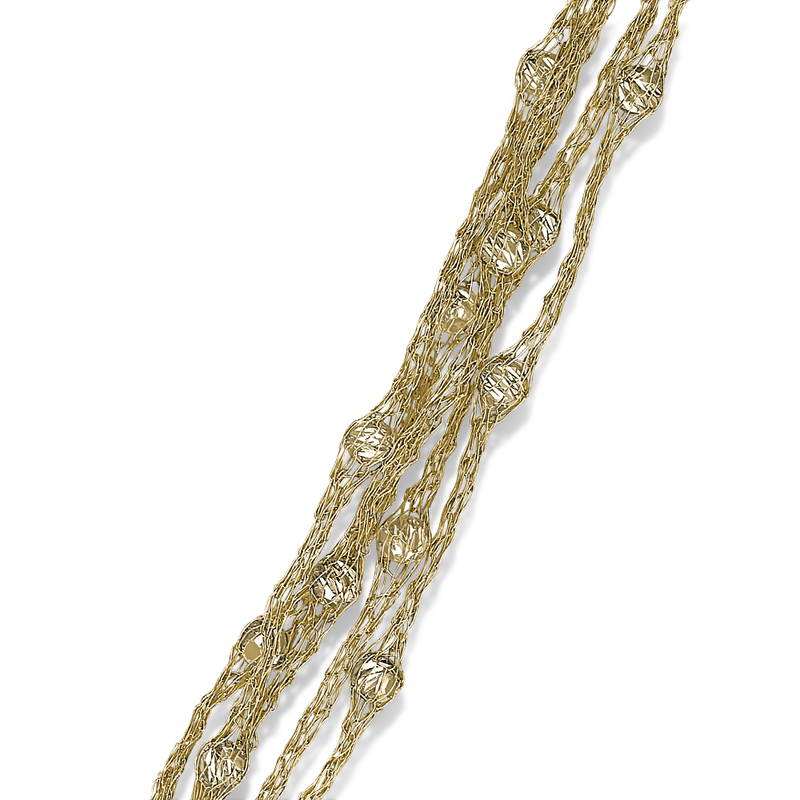 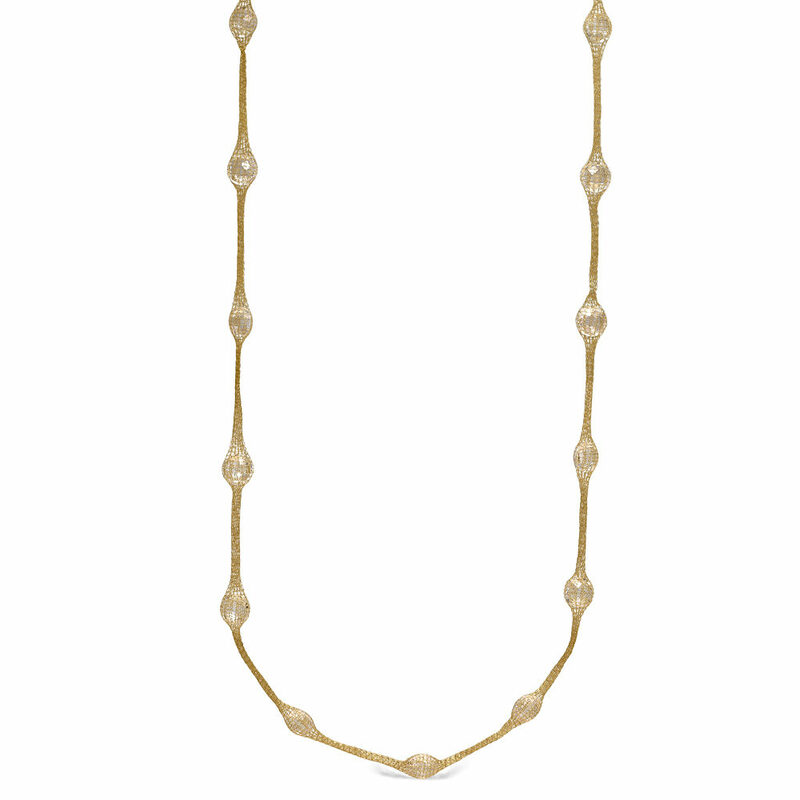 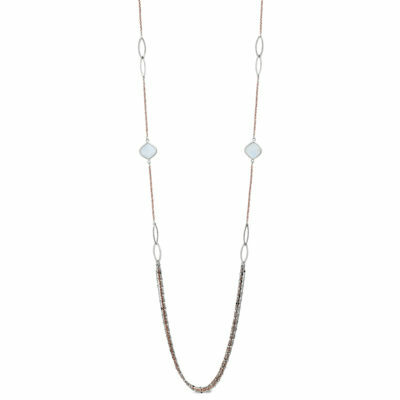 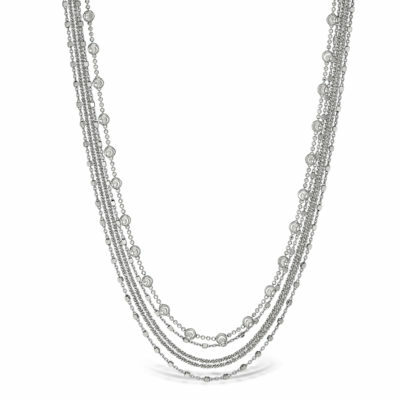 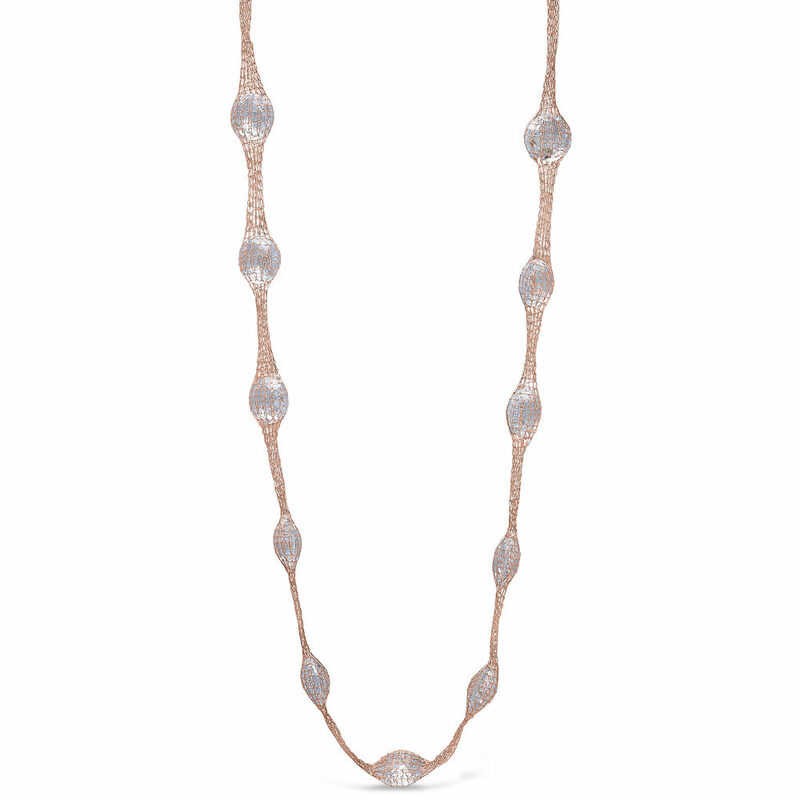 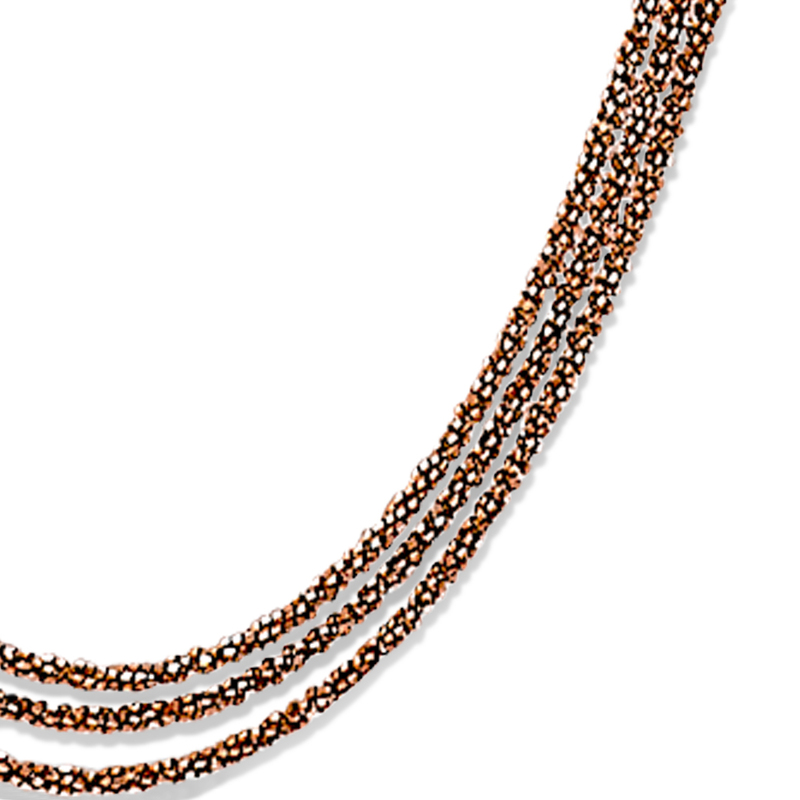 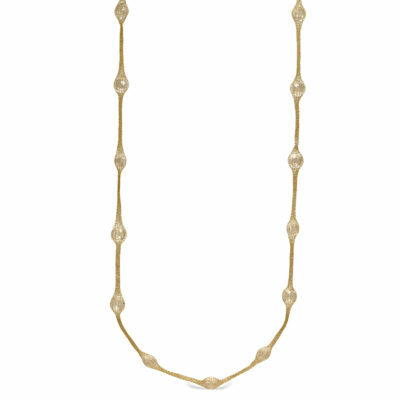 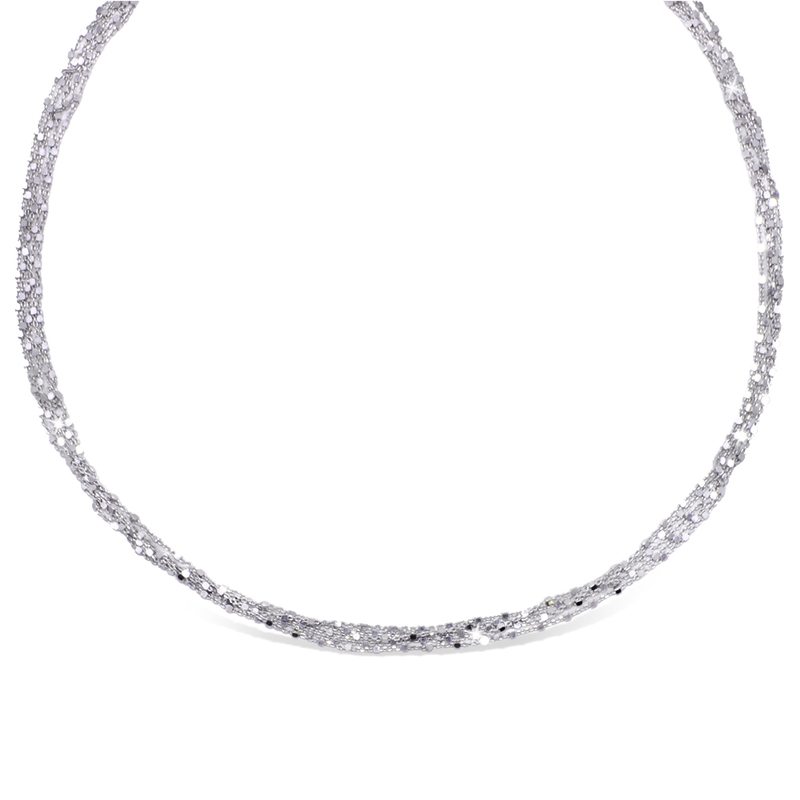 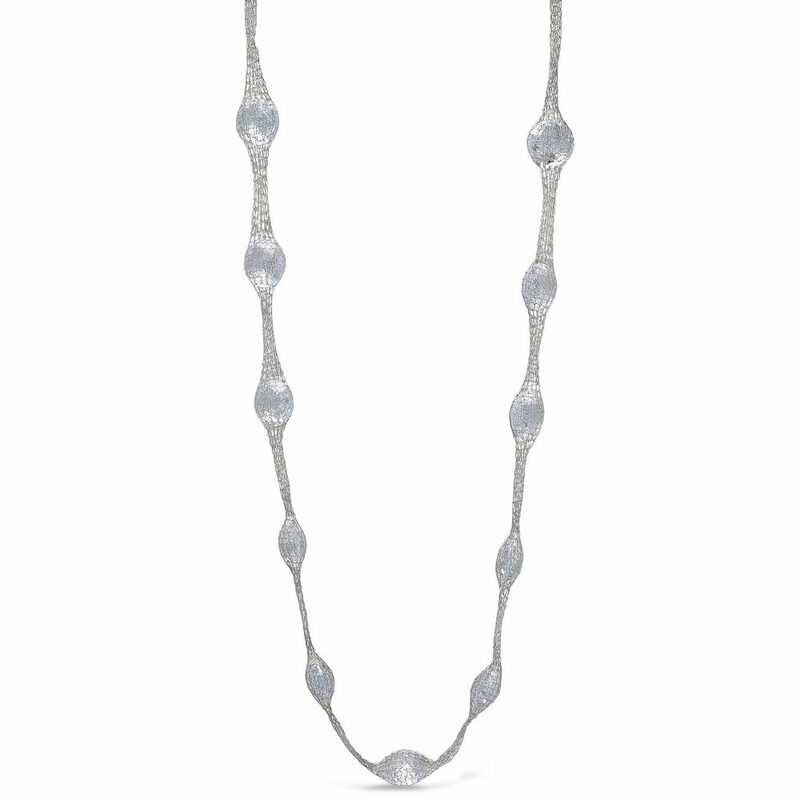 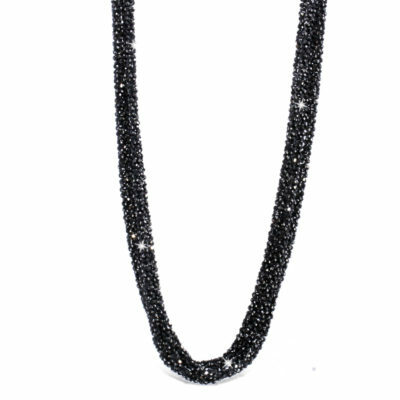 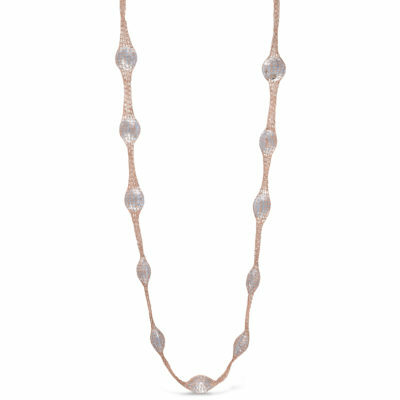 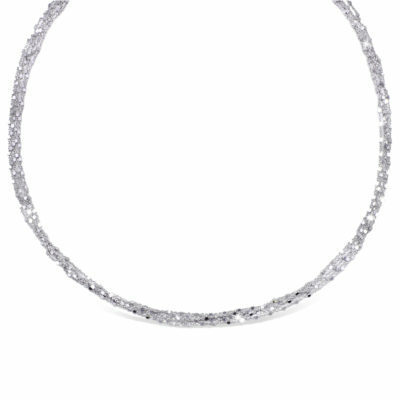 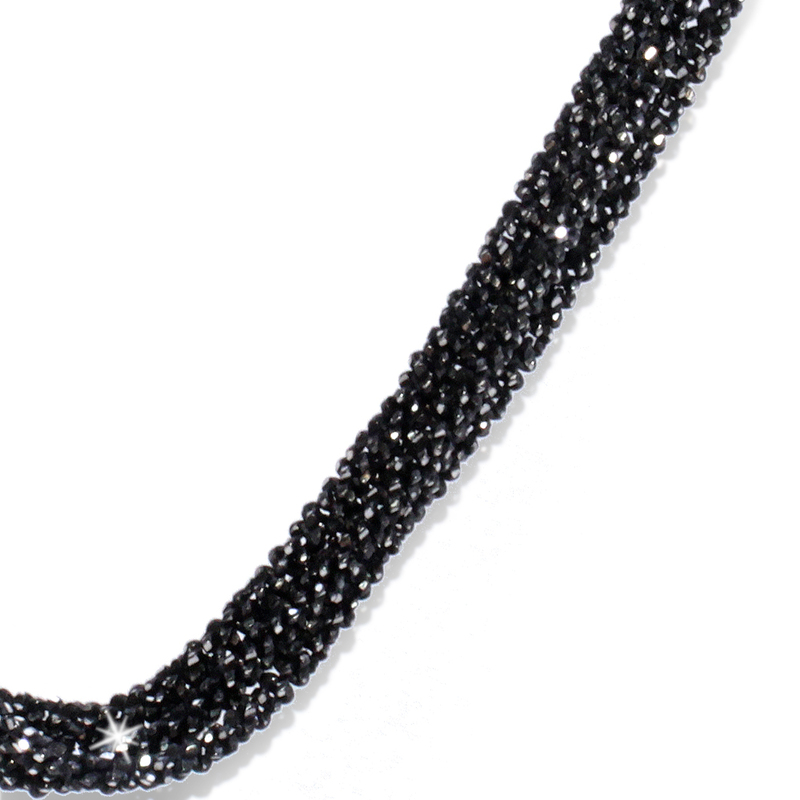 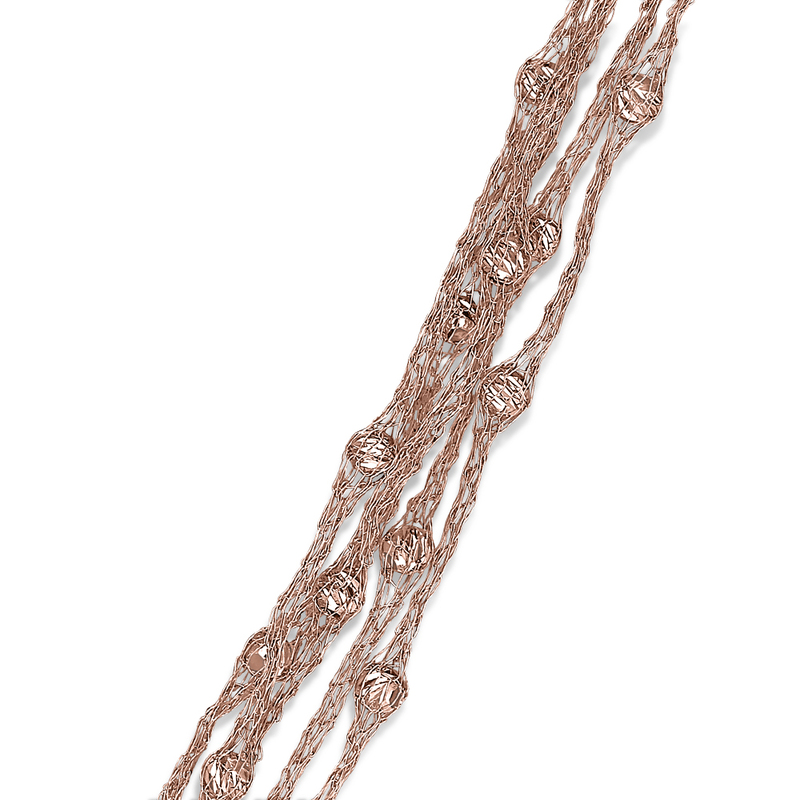 Diamond cut beads glimmer between faceted chain. 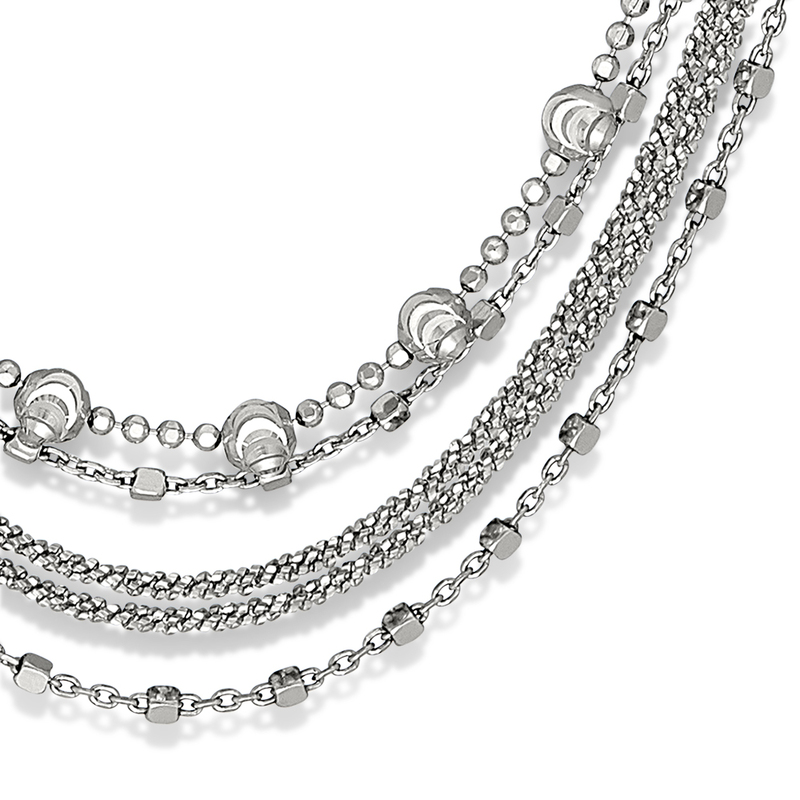 Magnetic clasp, easy to take on and off. Three layers of smoke faceted silver chains. 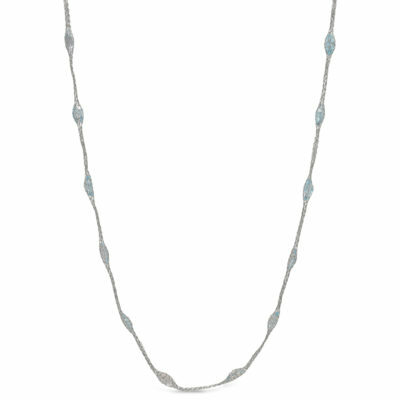 Diamond cut beads glimmer between faceted chain. 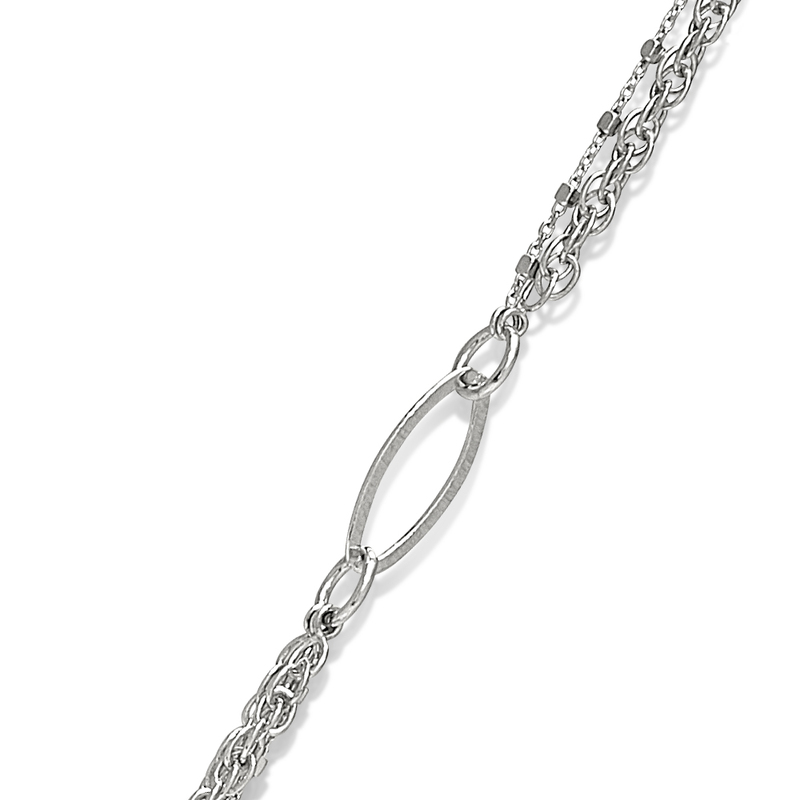 Magnetic clasp, easy to take on and off. 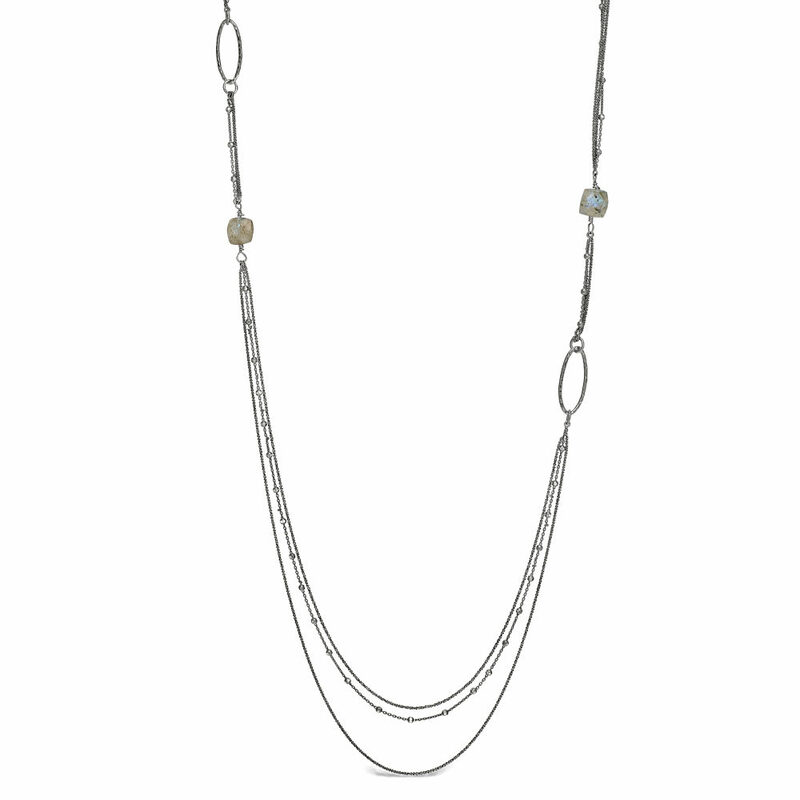 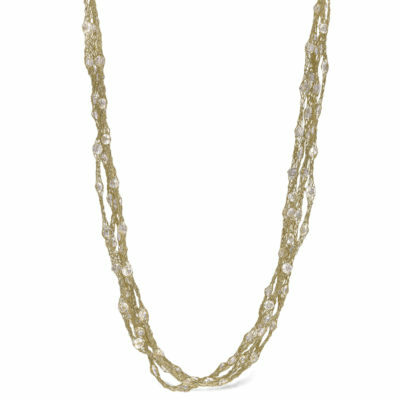 Silver yellow woven necklace with faceted quartz suspended between the lines of silver. Comes in 20 and 36in. 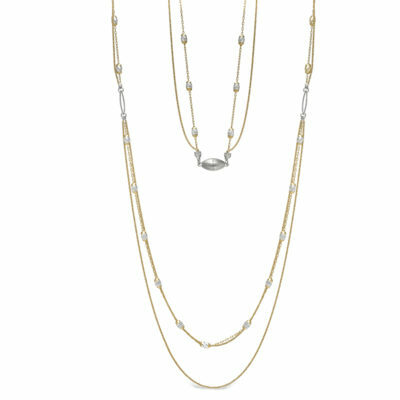 Silver yellow vermeil. 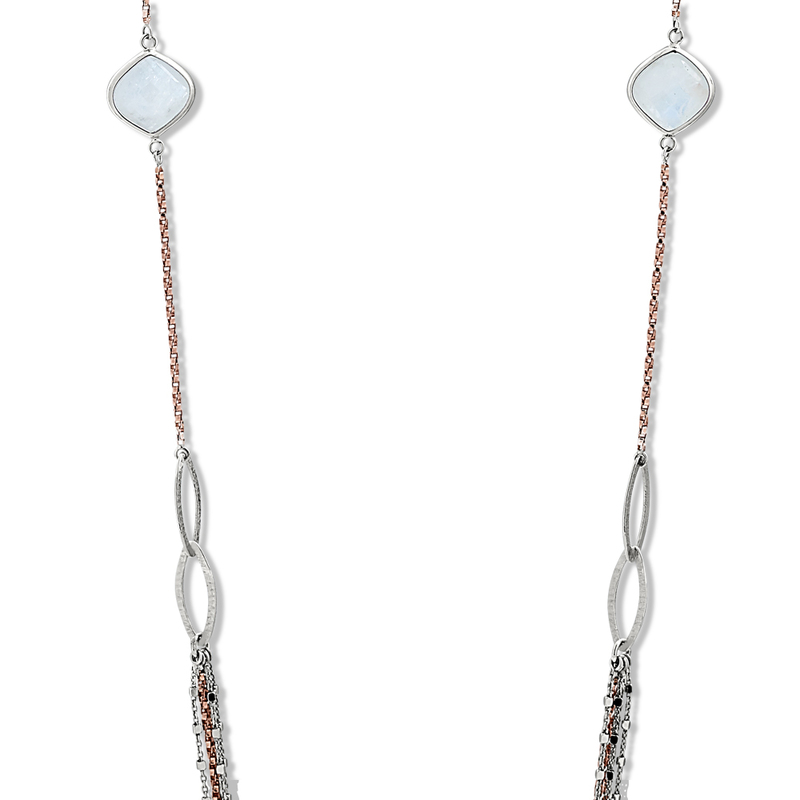 Silver woven necklace with clear quartz suspended between the lines of silver. Comes in 20 and 36in. 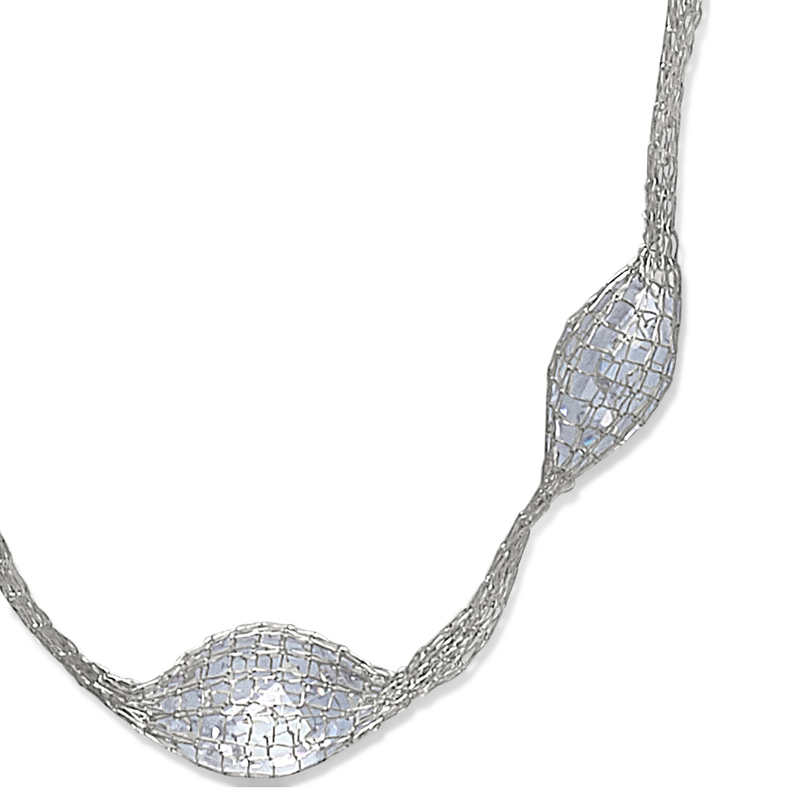 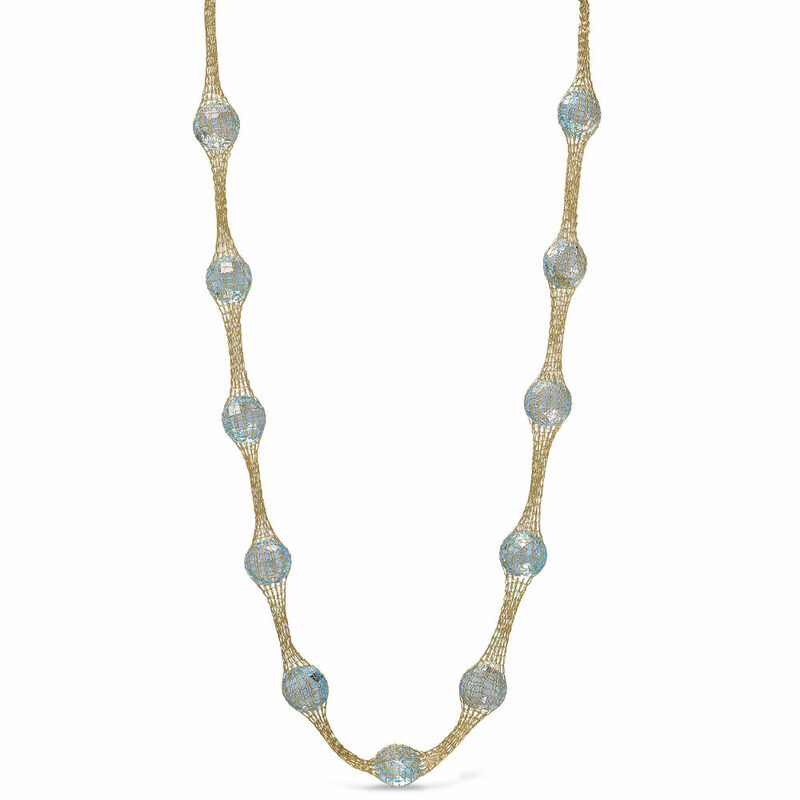 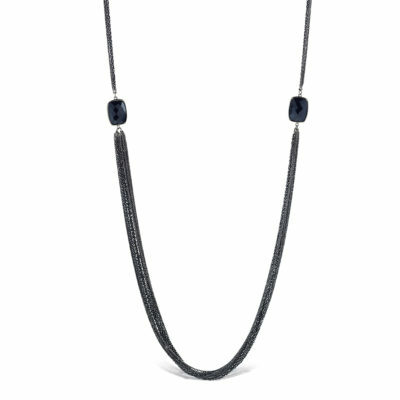 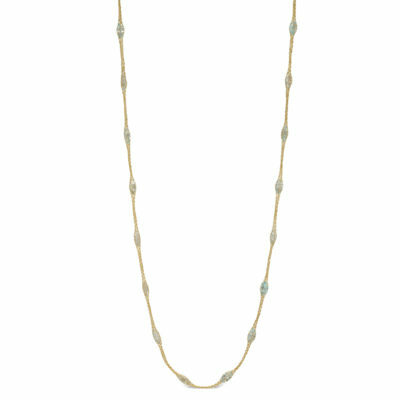 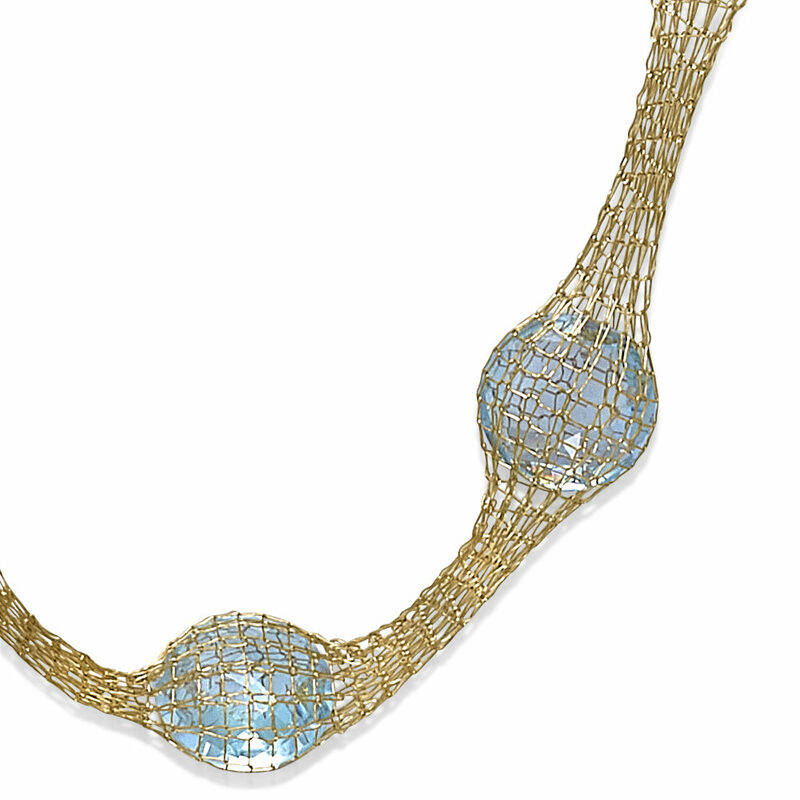 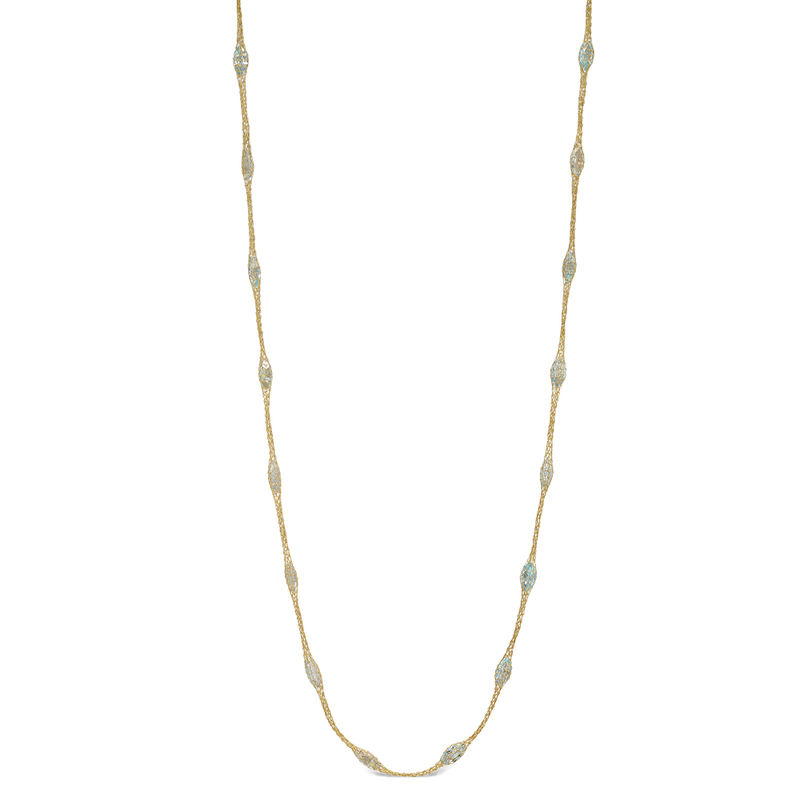 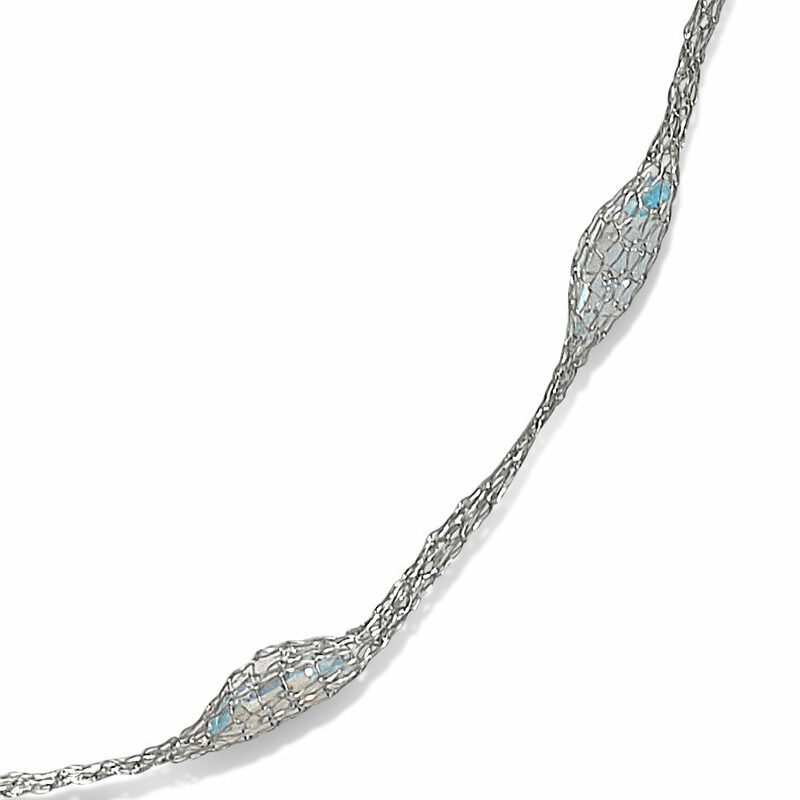 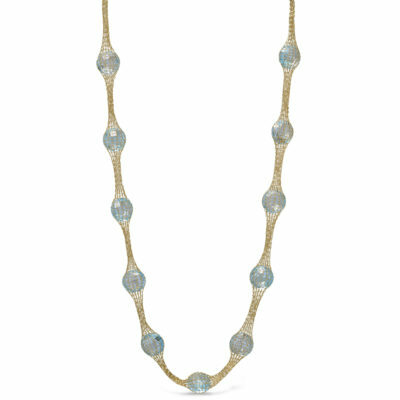 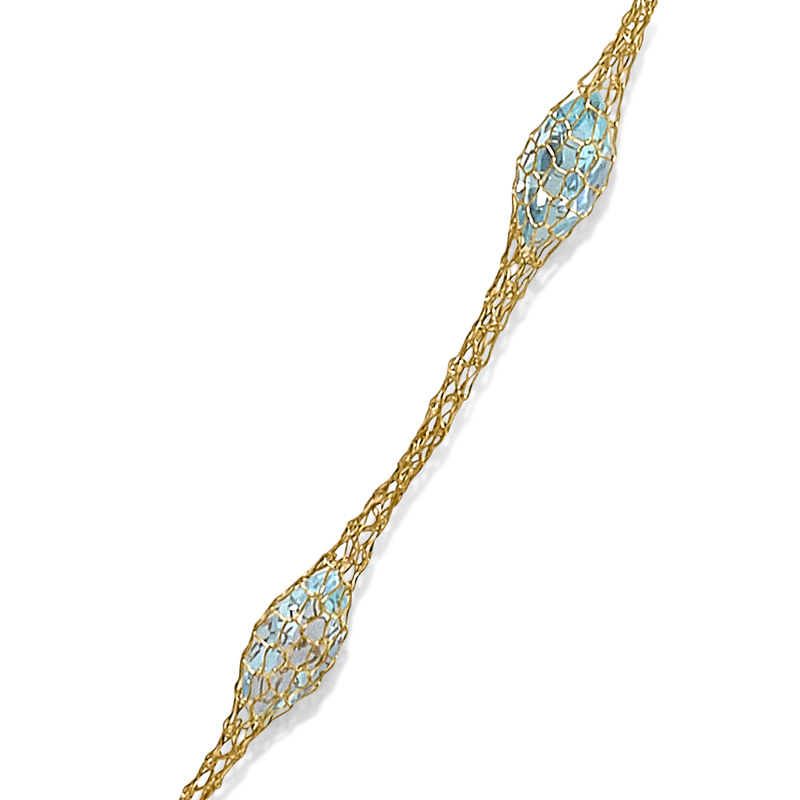 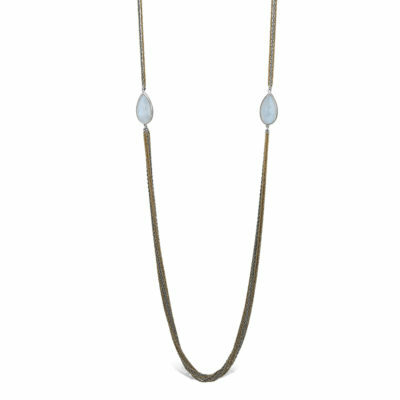 Silver yellow woven necklace with blue topaz suspended between the lines of silver. 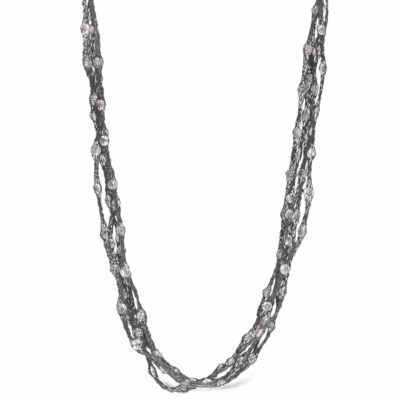 Comes in 20 and 36in. 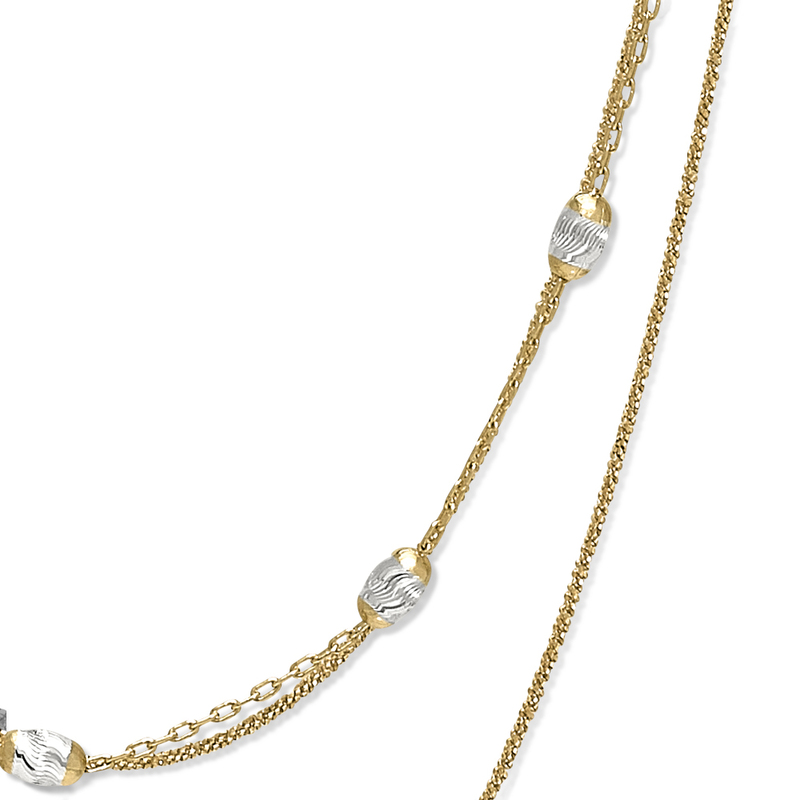 Yellow rose vermeil. 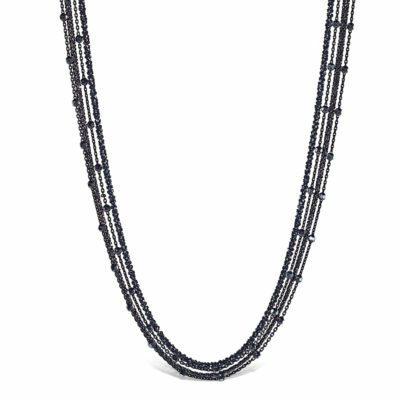 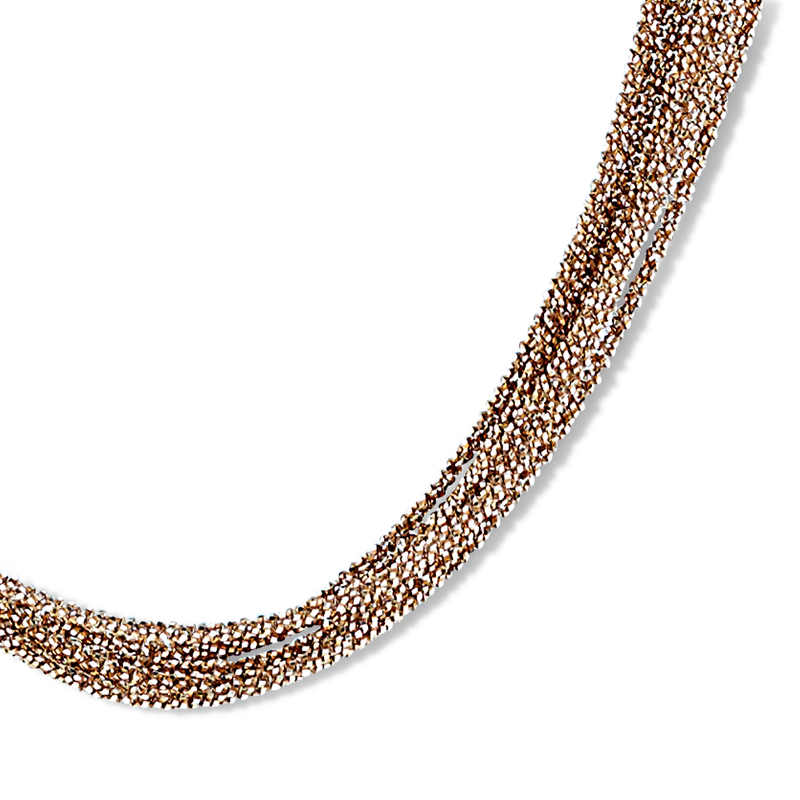 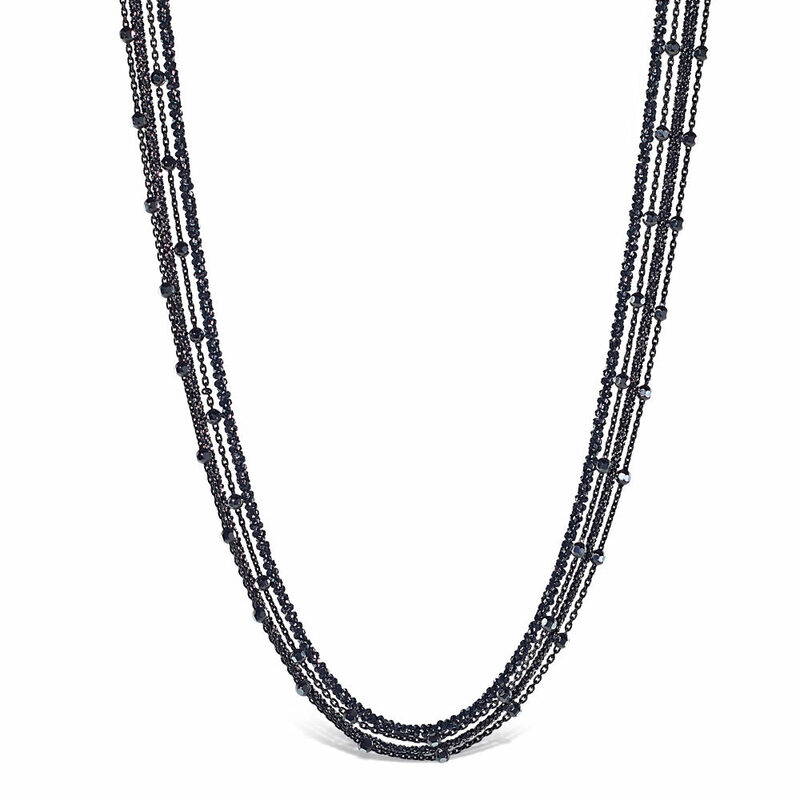 Silver woven 5 strand necklace with diamond cut silver beads.